Third, Beit Chana developed a graduate (master's degree) program in education for current teachers; the curriculum includes local classes, distance-learning, and intensive seminar sessions. 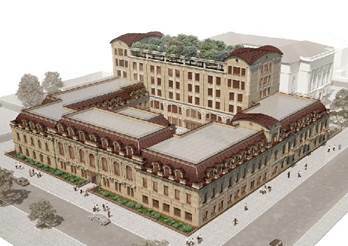 Fourth, the Institute soon will move to new premises in the center of the city close to the Golden Rose Choral Synagogue. An individual donor purchased a long-vacant building in a good location and is now reconstructing and expanding it to meet Beit Chana needs. Completion is expected in late 2015 or in 2016. According to Marina Mukhina, rector of Beit Chana, 120 young women were enrolled during the 2013-2014 academic year in existing premises. Sixty-two were day students, and 58 were boarders. In addition to the Beit Chana students, the dormitory also accommodated 12 to 13 girls of Jewish background who were enrolled in local public high schools; these secondary school pupils were from unstable homes and needed the supervision and stability that the Beit Chana residence could provide. Rabbi Meir Stambler, Executive Director of the Chabad Federation of Jewish Communities in Ukraine and an authority on Chabad education in the country, stated that negotiations with Touro College in New York regarding an affiliation between Touro College and Beit Chana currently are in an early stage. Rabbi Stambler perceives an arrangement in which Beit Chana graduates would receive Touro College degrees. However, he observed, Beit Chana must improve its academic standing in several key areas, including English, before Touro will consider such an agreement. 14. The International Hasidic Women's Seminary, which enrolled its first class for the 2011-2012 academic year, did not operate in 2014-2015. The seminary is designed to provide a second-year education experience for Chabad high school graduates who have completed an intensive first-year religious studies course elsewhere. The second year class completes a study program in hassidut, education, other subjects, and volunteer work in the local Chabad community. The failure of the institution to operate in 2013-2014 is attributed to a management dispute that left the seminary without professional leadership. According to Rabbi Meir Stambler (see above), an American woman has been engaged to direct the seminary, which is based at Beit Chana, in 2014-2015. Student recruitment is underway at Israeli seminaries enrolling English-speaking Chabad young women in intensive first-year study programs. Part of the appeal of the Dnipropetrovsk seminary to many Chabad young women and their families is its location in an area rich in Chabad history. Rabbi Stambler and his associates also believe that many Beit Chana girls from non-observant homes benefit from proximity to seminary girls. 15. Established in tsarist Russia in 1880 and later expelled during the Soviet period, World ORT returned to Russia and nearby countries as the Soviet Union collapsed in 1991. It now administers or collaborates with other organizations in the operation of 17 Jewish day schools in the former Soviet states and also manages technology centers in 20 vocational institutes and colleges in these countries. As noted, ORT oversees the informatika program in School #144. It also operates a community computer technology center that is housed in the Menorah Center. The writer spoke with Natalya Medvedova, who directs ORT pro-grams in Dnipropetrovsk. Natalya Medvedova, right, directs ORT programs in the Chabad day school and in the Menorah Center. The Menorah Center ORT studio is housed in one room and includes 12 Dell work-stations and one smartboard. It was opened in November 2013 and, at the time of the writer's visit in March, 2014, was still in a start-up stage. Ms. Medvedova stated that 54 individuals had completed courses in the facility since its opening; ORT does not monitor the ethnic background of its students, but Ms. Medvedova estimated that a minimum of 70 to 80 percent of students are Jewish. They advertise only within the Jewish community, she said. Perhaps some non-Jews who work in commercial concerns within the Menorah Center also had enrolled in ORT classes, she averred. To date, Ms. Medvedova explained, ORT has focused on three groups of potential students. The first was middle-aged adults, particularly those over age 50, who need instruction in basic computer literacy. The second target group was younger people, already computer literate, who were seeking professional courses in website development and related fields. A third group, to be initiated at the end of April, would focus on network administration. Courses in the latter two categories meet twice weekly for two-hour sessions over a period of five or six weeks. Fees are charged, but the cost to students is much lower than charged by commercial institutes. So far, said Ms. Medvedova, tuition assistance had been offered to two students. Each class enrolls ten to 12 individuals. Basic computer literacy courses for elderly people, Ms. Medvedova continued, should enroll even fewer pupils. Almost all professional courses convene in the late afternoon or early evening so that people can upgrade their computer skills after work. Sunday classes will be offered in the near future to further accommodate working people. Ms. Medvedova sees the primary market for ORT courses as the Menorah Center itself. Many people work in the building, either in businesses occupying leased commercial space or in communal organizations. The business plan for the ORT computer center focuses on three skill sets, said Ms. Medvedova: system administration, web design, and infographics (graphics accom-panied by text, widely used in instructional and science materials). Each individual completing appropriate courses will receive internationally valid certificates that will facilitate employment almost anywhere in the world. Unlike the Hillel computer center, ORT does not offer placement services. 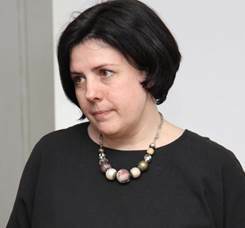 However, said Ms. Medvedova, many students are unemployed or underemployed and have specific employment objectives. For those students who are uncertain about future careers, ORT will orient them toward specific IT fields with good employment prospects. Natalya Medvedova (standing, wearing dress) works with adult students who had arrived early for a late afternoon class. She also helped one of the students who had brought an i-Pad tablet to class, seeking assistance in using several specific apps. 16. Tkumah - The All-Ukrainian Center for Holocaust Studies is the most comprehensive Holocaust research center in Ukraine. Under the leadership of Dr. Igor Schupak, its director, Tkumah opened its nearly 3,000 square meter (approximately 10,000 square feet) Museum of Jewish Memory and Holocaust in Ukraine in October 2012. The Museum is located within the Menorah Center, and the openings of the Menorah Center and the Museum occurred concurrently. As its name suggests, the Museum is designed to present a comprehensive history of Jewish life on Ukrainian land. Exhibits about the Holocaust dominate the Museum, but ample space also is committed to an expansive history of Jewish life in Ukraine. Jewish ritual objects are displayed and explained. Where actual artifacts are unavailable, the displays are filled in part by custom paintings and multi-media presentations. The four large halls (with movable partitions) cover Jewish history, including shtetl life, pogroms, the Jewish intellectual and cultural role in Ukraine, the prominence of Ukrainian Jews in the Zionist movement and in modern Israel, the Holocaust in Ukraine (including righteous Ukrainians who saved Jews) and elsewhere, and post-Soviet Jewish life. The history of Jewish life in Dnipropetrovsk is covered in some detail. The museum undergoes a process of continuing renewal, said Dr. Schupak. Interactive displays are changed periodically, different artifacts are recovered and displayed, and entire new exhibits are opened. Traveling exhibits originating elsewhere are sought and displayed. Managers of the Museum are very conscious that it is a Jewish museum on Ukrainian land. Its perspective is Ukrainian, said Dr. Schupak; it must be sensitive to Ukrainian history. However, Dr. Schupak continued, the museum has no "blank chapters." It covers the Khmelnnytski pogroms (in 1648), other pogroms in Ukrainian history, collectivization, the Holodmor, and the Soviet terror. The role of Jews as both victims and perpetrators of certain Soviet crimes is acknowledged. The principal language in captions and other explanatory materials is Ukrainian. Dr. Igor Schupak, a native of nearby Zaporizhzhia, earned a Ph.D. degree at a Canadian University. 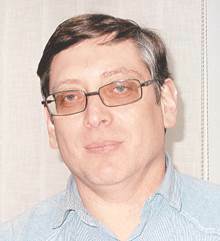 He was recruited by Rabbi Shmuel Kaminezki to organize Holocaust research in the Dnipropetrovsk area and to develop Holocaust teaching materials and exhibits. Visitors to the Museum are overwhelmingly non-Jewish, Dr. Schupak stated. They include school groups from throughout the region, as well as youth groups, teachers, historians, and ordinary tourists. As a research institute, Tkumah investigates Holocaust sites, pursues a comprehensive publications program (scholarly monographs, a research journal, collections of documents and memoirs), and attends and hosts conferences. It collaborates with relevant academic, museum, and archival institutions elsewhere in the post-Soviet states and in Israel, Europe, and North America. Its educational program includes seminars for teachers and students, publication of history textbooks, sponsorship of secondary school and university history clubs and conferences, and popular education for adults. The last-named includes "Sunday University," a successful program of history lectures open to the general public. Dr. Schupak enumerated a number of Tkumah activities during the past year, some of which are related to the current political crisis. Many individuals in eastern Ukraine, said Dr. Schupak, fear an invasion by Russia or provocative behavior by Russians or Russian agents in eastern and/or southern Ukraine. In response, Dr. Schupak has been giving lectures in these regions on "constructive patriotism," that is, Ukrainian patriotism that steers clear of chauvinism and xenophobia. He encourages discussions on the more controversial periods of Ukrainian history. He promotes dialogue with institutions of other ethnic groups, including Ukrainian Catholic University (Lviv). They have organized seminars on tolerance throughout Ukraine, from Lviv and Rovno in the west to Luhansk in the east. Tkumah has been a key contributor to the work of a Ukrainian-Polish committee that prepares seminars for Ukrainian and Polish teachers of history. Tkumah continues its investigations of Holocaust sites and Holocaust-related documentation; new publications on these topics are produced every year. A three-year collaboration with Yad Vashem in Israel has led to seminars for Ukrainian teachers on the Holocaust and World War II in the context of world history. Such seminars have been held in each of Ukraine's 24 oblast centers and have spurred the development of multimedia teaching materials for Ukrainian schools. Beit Chana currently is located on the east bank of the Dnipr River, using a former municipal kindergarten building as its academic premises. Its dormitory premises also are on the east bank, in a somewhat remote area. Boarding students commute between the two facilities by special bus. See page 54 for the remainder of the interview with Rabbi Stambler. The acronym ORT derives from the original Russian title Общество ресленного и сельствохозяйственного труда (Society for Trades and Agricultural Labor). The acronym has persisted for more than 100 years. The Holodmor (deriving from the word golod or holod, which means hunger) was a man-made famine occurring in 1932-1933 in Ukraine and several adjacent areas of Russia that is believed to have killed three to seven million people. Major causes of the tragedy were collectivization of agriculture and rapid industrialization. Tkumah research and education offices are located in premises adjacent to the museum. Some of these materials remain unused because schools cannot afford to purchase them and/or municipal education bureaucracies are reluctant to approve the introduction of new curricula.